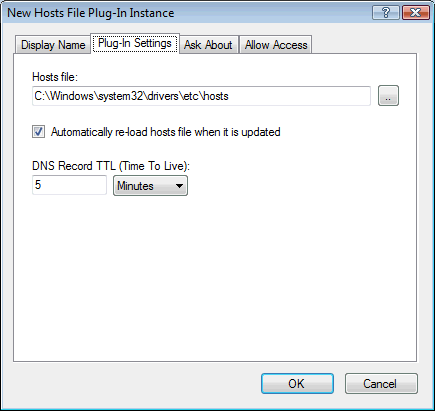 This plug-in serves host (A/AAAA) and reverse (PTR) DNS records from a standard hosts file. This can be used as a very simple way to store and host DNS records, but more commoly this is used to block ads and malicious web-sites. For more advanced web-site blocking, see also the Domain Blacklist plug-in. You can use multiple hosts files by setting up multiple "Hosts File" plug-in instances. Defines an A-Record (example.com -> 1.2.3.4) and a PTR-record (4.3.2.1.in-addr.arpa -> example.com).